So I was at about 95% HP, when I got hit by ONE stray AP shell from a battleship... and lost over 9300+ HP. I survived. It was not a detonation. I was under the impression BB AP is supposed to over-penetrate? My DD has no citadel? Then what the heck is 9300+ damage from one shell? Did WG change anything during my hiatus? Is it just bad RNG? Because I'm starting to notice that BB's can basically do to destroyers exactly what they do to cruisers. Two volley, blap, blap, dead. Dispersion, over-pen, etc don't seem to be much of a factor. BBs can get full penetrations on DDs just like on any ship. However, "double-dipping", where one shell would do pen and overpen damage was fixed. Yep they buffed BB accuracy a while back causing a whole chain of issues, IMHO. Now they have a problem with BB overpopulation. Anyway, BB AP is scariest when you are bow-on or stern-on, because the shell travels through enough ship to trigger. 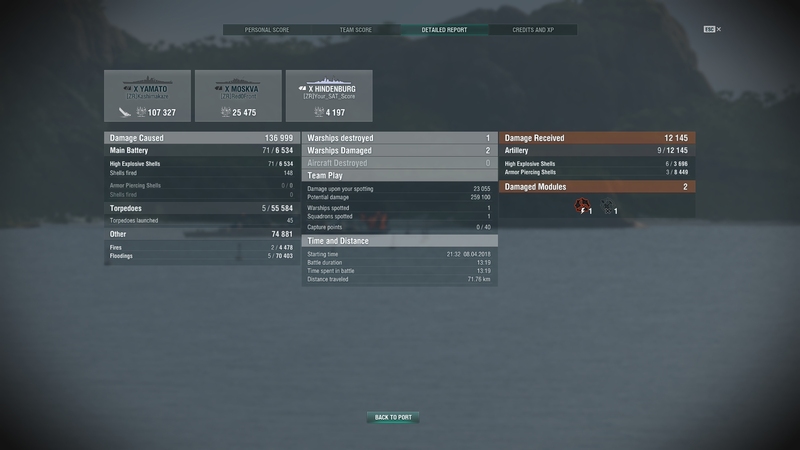 Going broadside in a DD is actually the better option if you know you’re getting blapped, because then you’ll suffer overpens instead. But it’s a no-win situation. Run and get penned through the stern, or go broadside for overpens but fail to escape. Best option will depend on your range and time to nearest cover / concealment. Longer ranges, show stern and wiggle to dodge. Shorter ranges, go broadside, torp, and pray to get away. They haven't fixed that yet. WG is still working on a damage model that actually works the way they want it to. All the stuff you saw from the CC summit and that waterline video was just the devs sharing what they had tried but it didn't get out of the initial testing phase because they didn't like how it worked and how it changed some other things. If a cruiser helps; great. In my experience though the only person a battleship driver can count on to defend against a destroyer is themselves. Being successful at doing so isn’t that complicated, you just need map awareness, WASD, steady nerves, and straight shooting. So is that why they can nail a Kiev at 15kms going 48 knots without fail? Like... this is getting silly. The whole premise to this game is "Rock, Paper, Scissors". Or so I was told. Destroyers are specifically designed to counter battleships. And now a battleship is the "Swiss Army Knife" of Wows? Able to do all? Useful in any situation? Yeah, there's a real problem not just with the "superpen" problem (which is effectively a Pen + Overpen, or 43% of the max damage from a BB AP shell), but the fact that normal pens are quite common, REGARDLESS of angling. Being broadside on to a BB shooting AP will still have you eat the occasional pen, and the chance of a hit being a pen vs overpen gets worse the more you angle. Your 9300 damage from a single shell isn't possible (short of a detonation, which you indicated it wasn't). Go look at the Detailed Stats page to see how many shells from that BB hit you in that salvo. It was more likely 2 superpens or 3 normal pens. Which is a semi-regular occurrence, as BB accuracy against DDs is sufficiently high that scoring multiple hits per salvo at under 10km is common, and not that rare out to 15km. It's stupid, and it does break the RPS balance. Particularly since the massive damage of AP shells means that all BBs (except RN BBs) should generally prefer AP over HE against DDs, when looking to maximize average damage. If were at that range than that was a lucky shot. Not all AP will be overpen on a DD, you can get normal pens too. The buff to accuracy happened years ago, back in CBT and it was to all ships, not only to BBs. The game is not baesd on RPS (rock-papaer-scissors) anymore. In fact, RPS never worked. WG tried to balance the game in RPS way, but it never worked and RPS is very frustraiting so WG just moved away from RPS. They buffed all accuracy at short ranges, 3km and less. The change did result in a very slight improvement to accuracy above that range. Claiming that they buffed BB accuracy is lying by omission. None of which, nor the double dipping, would explain the OP's claim to have suffered a 9300+k single AP hit from a BB. Even a double dipping Yamato shell wouldn't do that much. He had to have been hit by multiple shells. Sure didn't look like multiple shells. I remember it vividly. It happened maybe 14 hours ago. I remember seeing the floating number of "9338"? I was running away. Stern pointed. The least amount of target available to shoot at. Hence the reason of this post. Over 5000+ games played and probably over 3000+ in DD's... I've never seen anything like it. So now it looks like there's a balance issue concerning AP. I never see BB's even use HE, except maybe the British ones. AP just kills everything. They don't have to switch ammo types. They can hit anything regardless of range. Cruisers and using fleet support as supposed to is null and void. And overpens are.... gone it appears. Two good volleys. Ur dead. The BB AP vs DD issue has been around awhile, and there's a pretty good commentary on it from Flamu about why it's a really bad thing from a game balance/playstyle perspective.. I happen to agree with him - WG should simply make it that all AP shells above a certain caliber (e.g. 300mm or so) should ALWAYS overpen when hitting a DD. OP - Since you didn't remember what shot at you, I'm assuming it was a T8 or T9 BB. With those kind of guns, 2 shells (1 superpen + 1 pen) would do about 9300. It's easy to not see both shells land. Which is why you have to look at the Detailed Report screen afterwards. That explains why a Lyon can dev strike a full health dd. Even 2 shells out of 16 doing 9.3k damage would be enough to blap a dd. BB AP is broken and causes too much damage to DDs. WOW knows this. WOW is not going to fix it because BBs are cash cows. Simple as that. Ignore most of the ignorant replies above. BB shells will only detonate inside a DD if the DD is hit an an angle in which the shells literally travels the length of the ship, inside the ship. Aka the shell is going through the nonexistent armor of the DD then smashing through every piece of machinery and paper thin armor plate until it detonates. Do you know when the shell happens to fly almost horizontal to the water? VERY. CLOSE. RANGE. Under 8km's usually. BBs have learned to hold their fire on DD's until the DD turns away or towards the BB and fire one turret at a time hoping for such a hit. RNG guarantees such a hit is extremely rare to happen...and when it does it will NOT kill a full health DD, only a DD that has been hurt already..with one exception: Russian DDs. Why? Soviet DDs have as much armor as cruisers of their tier. That makes them easier to get these full pen hits because you don't have to hit them so the shell travels the length of the DD.. as long as soviet DD is angled 30+ degrees towards or away from the BB the shell has a high chance of detonating inside it. Having WG remove the BB's ability to do that is going to remove the last thing BBs have to defend vs a DD that pops into view at close range. Secondaries don't do crap vs a DD unless its a german ship with a 2ndary gun spec AND the DD appears broadside to the BB... and secondaries do not do anything to kill or hurt the DD that much unless the BB remains showing full broadside... which never happens given any BB with a clue turns towards the DD the moment it pops into view at such close range... 'cause torps are coming. How is this really different than anyone else in game? Who is the Destroyer relying on when planes show up? I have very little sympathy for Battleships, they are capable against EVERY foe they face, something not every class can say quite so easily. When you think about, the chance of doing full pen damage to a destroyer with battleship AP is a needed mechanic from a balance standpoint. Given that we can pretty much all agree that real "teamwork" is never going to occur in random battles, a battleship player needs some form of personal defense against a ship which can otherwise completely wreck their day (either via a torpedo dev strike or the 'death from a thousand cuts' principle of ships like Kiev). Switching to HE whenever a destroyer pops into view isn't practical given the loading times, and except in the case of dedicated secondary builds on T8+ battleships, the secondaries aren't going to do enough damage to prevent a destroyer from having its way with whatever BB it chooses. Getting nothing but overpens from main gun hits wouldn't either. To say nothing about the lunacy of a small, unarmored ship being able to shrug off multiple hits by explosive shells the size of a small car. Incorrect. I play T5-T10 DDs. In a DD it does not matter what angle you face to a BB you take massive 50%-70% or more AP damage, even from 12km+ range. There is simply no right move in a DD when a BB targets you. That's what's broken. There is zero reason for a BB to ever switch from AP to engage a DD. BB AP is broken vs. DDs, and WOW knows this, but is not going to fix it because BBs are their bread-n-butter. If DD torp damage to BBs was broken in the same way WOW would have fixed it immediately. This is a game so the the "real world" nonsense is moot because in the "real world" a single DD torp would totally wreck a BB. Your experience is far different from mine, both while playing destroyers and while playing battleships. I welcome you to check my stats to determine how much weight you should put into my statements; I'd do the same for yours, but they appear to be hidden. Blaming game mechanics is much easier than taking the effort necessary to adapt to them, but it's also doing a disservice to yourself. solution to your problem is to never try to bow-on towards a BB. Yes, you have a far greater chance of that BB missing your skinny rear, but IF it does hit, it will have a higher chance to hurt you more. Broadside gives the BB a better chance of hitting you, but the over-pen is almost guaranteed. This crap about it being lucky or just bad RNG is baloney. I've played competitively for a few years now as a DD main. The real issue we have is the BB fire. CA fire is nothing unless its from sub 10km for most CAs. To the extent most of my dodging effort is expended against any BB shooting me at any range. Watch some of the competitive streams. It is absolutely commonplace to see a BB blap a DD for 7k or more every couple of games. If you are within 15km of a competitive BB player, you should expect to lose a third to half your HP in a single salvo, and plan accordingly. Further this nonsense of BB AP must travel the length of your ship to get a full pen is a fallacy. I've sent WG replays and screen shots of my Shimakaze receiving a near broadside hit of 3 shells from a Yamato at almost 16km. I've attached one of the screen shots of a clan battle against ZR this season. The three Yamato AP shells did 8449 damage, almost 40% of my HP. The most likely way the damage was calculated one pen for 4,884 and three over pens at 1,480 each for a total of 9,324. Saturation reduced the damage to 8,449. At least one of the shells double dipped for damage. The pen hit just short in the water then entered below the water line. As it has been explained to me that shells hitting the water will slow increasing their likely hood of detonating inside a ship. I suspect the double over pen occurred passing through the aft and mid ship compartments before exiting. The hit appeared to have occurred close to the compartment lines and was just able to make it across. My best guess is the ballistics calculator says the shell over penned both compartments and counted it twice. The double dipping of a single AP shell is a clear bug that needs addressed. This bug effects all AP in all ship types, however it is most notable in BBs due to the higher alpha values. This is a separate issue from DDs receiving AP pen damage. The belief that BB shells should be permitted to score pen which comes to roughly 22% of a DD HP with each pen is contrary to what one of the Devs has stated. To put it into perspective Yamato will deal 14,800 citadel damage to a Des Moines that has 50,600 HP. That works out to 29% of the Des Moines HP, however the DM can heal 33% of that back reducing the damage to 9,916 Hp which works out to almost 20% of the Des Moines total HP. It should be noted that BBs are intended to directly counter CAs, and DDs counter BBs. Also note that I am comparing percentages of damage for citadel damage to CAs vs pen damage to a DD. If the CA can heal, the pen is more damaging to the DD percentage wise. At the heart of the issue is a BB shooting at a DD leaves the DD with no real counter play options. Do you remain broadside and risk taking far more over pens, or do you try to angle and hope you dont receive one or two pens for 20-50% of your HP? Either way you are probably going to lose 20-50% of your HP. Please explain why you feel BBs need to be more effective against DDs (their counter) than they are against the ships they are intended to counter? So your position is that while CAs can angle to mitigate damage from their counter, DDs who counter BBs must have to risk taking massive damage no matter their actions if they are detected. Is this good game play? No wonder the place is crawling with BBs. CA's that angle still have to deal with the possibility that a BB's AP WILL citadel them no matter the angle they present. Their "counter" is the same as the DD's with the same risk. Show the front and pray to RNG that that BB's rounds land around you and not on you, but risk getting hit harder if/when that shell does land. The thing about DD's is, you don't have a citadel to worry about if you are showing your sides. Which means that you can do so and not have to worry about being instantly deleted by one salvo. Hurt like hell, you bet IF that enemy BB gets more than 2 or more rounds into you, but you wont die outright unless he gets every shot into you. You can't say the same for a cruiser. 2-3 AP shots to the citadel and that cruiser is toast. 2-3 shots into the sides of a DD and that DD is hurt, but still moving around on the map. In addition, the chances of a CA actually tanking a BB's AP round and not feeling it is slim. Slimmer still depending on what nations ship you choose to go with. Have you tried tanking bow-on to a enemy BB in a British cruiser? Even tanking bow-on in a US cruiser is risky and enemy AP from larger calibers do citadel you even if you're pointing your nose directly at them. Your DD has two of the best defenses in the game. 1 Concealment and 2 being the smallest target on the map. If you are having problems, it's not the BB's being able to damage you that's the problem. Your problem is being seen. Turn sideways if you want to reduce that AP damage to negligent levels or try to avoid the shots by giving them a smaller target. Or avoid both of those situations and remain unseen. What DD are you having problems in anyways? An angled CA mitigates that damage. Yes you might take 1-2 cits, but it will not devastate you like if you were broadside. This is balanced game play mechanics. A DD going broadside is just as likely to eat as much damage as one that angles. The idea that you should just not get detected is a cop out. You have it in your head that this is acceptable, when the devs themselves have said multiple times that this was not intended, the pen damage on DDs was too great for their HP, they are looking into a way to eliminate this issue. Eventually the new ballistics system will be here if the game wants any chance of being an E-Sports. BB AP performance on DDs is literally one of the biggest memes in the game. Everyone whos anyone in the game recognizes it as a flawed design, including WG themselves. You obviously do not grasp the issue at hand. DDs doing their jobs will be seen. Either from another DD, a spotting plane, or radar. I could play like a piss poor DD player, ignore the objectives and obliterate players like vengeful god, but that isnt going to win games. The issue is when DDs are spotted, a BB from over half the map away can take 50% of their HP in a single volley. That according to WG was not intended. BBs being able to punish DDs so heavily have pretty much eliminated the need for CA support beyond being a radar spotting [edited] so the BBs can farm DDs. Ship types have to have weaknesses to encourage team work. Without team work, you fall apart in the face of something that counters your ship. So yes, a BB should not be able to handle a full HP DD on their own. This will force BBs in closer to their CAs, and be another check against the camping meta.